Astronomy Magazine is a monthly magazine dedicated to astronomy and amateur astronomers. Buy a single copy or subscription to Astronomy magazine. The first issue was issued in 1973. The magazine is growing in popularity and now has a readership of 114,080 which makes it the top selling in the world. The publication is primarily aimed at amateur astronomers with language that is easily understood by non-scientists. Stephen A. Walther is the founder and was an amateur astronomer himself. There are also articles for professional astronomers in the first half of the magazine. Most of the articles and information for hobbyists is in the second half of Astronomy Magazine. In Astronomy Magazine, you will find columns on viewing skies, constellations, sky events, and astrophotography. There are in depth articles on astrophysics, and different aspects of astronomy by experts in the field. You will also find how-to articles on observing techniques with binoculars and telescopes, and a star map is included in each issue. The monthly map illustrates how to look at the evening sky in order to see stars, comets and planets. The kinds of subjects you will find include space exploration, exobiology, cosmology, and scientific research. The writers are professional astronomers and astronomical observatories. 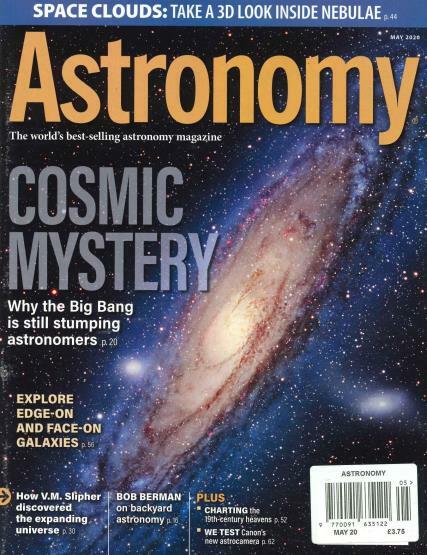 Regular contributors to Astronomy Magazine include Stephen James O’Meara, Bob Berman, Glenn Chaple, and Phil Harrington. Articles include information on deep sky objects, telescope manufacturers, new product news, astronomy events, and reviews of telescopes and other equipment.